As well as playing a significant role in the republication of David Lindsay's works in the late sixties and throughout the seventies, Colin Wilson has written a lot about Lindsay. This page lists all the significant pieces I know of. Wilson's primary interest is in what he has named "The New Existentialism", a more optimisitic version of the literary and philosophical movement of the mid-20th century. As such, his literary criticism is "Existentialist Criticism", which seeks to understand a writer's philosophy from his or her life and works, and to evaluate that philosophy in terms of Wilson's own. In a way, every article or book by Wilson can be seen as a hologram-fragment, pieces of a single larger work, with the same basic theme — of the need to overcome the limitations of everyday consciousness — coming to the fore whether the subject is crime, biography, science, the occult, philosophy, fiction or literary criticism. 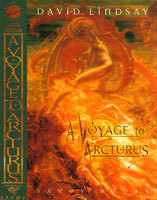 Wilson has praised A Voyage to Arcturus in high terms, calling it "one of the strangest, and most certainly one of the greatest, books of the twentieth century". As well as writing about Lindsay, and providing introductions to several important reissues, he has done a lot of work behind the scenes which has led to Lindsay's books being made available to new generations of readers, and as such is an important figure as regards David Lindsay's continued reputation. Wilson is deeply (and increasingly) critical of Lindsay's prose style; reading all the below-listed writings, you can find yourself witnessing something of a self-increasing feedback loop as, for Wilson, Lindsay starts off making "a bad first impression" with his prose style, and in later essays is "a writer of amateurish clumsiness", writing "like a retired maiden lady", and, eventually, is found to be lacking "the literary talent that so many third-rate novelists possess in abundance". (For a defence of Lindsay's prose, see my opinion piece elsewhere on the site.) But despite this, Lindsay is always redeemed for Wilson thanks to the force of his imagination, and the power of his visionary embodiment of ideas in his fiction. Wilson remains an essential commentator on Lindsay's life and work. 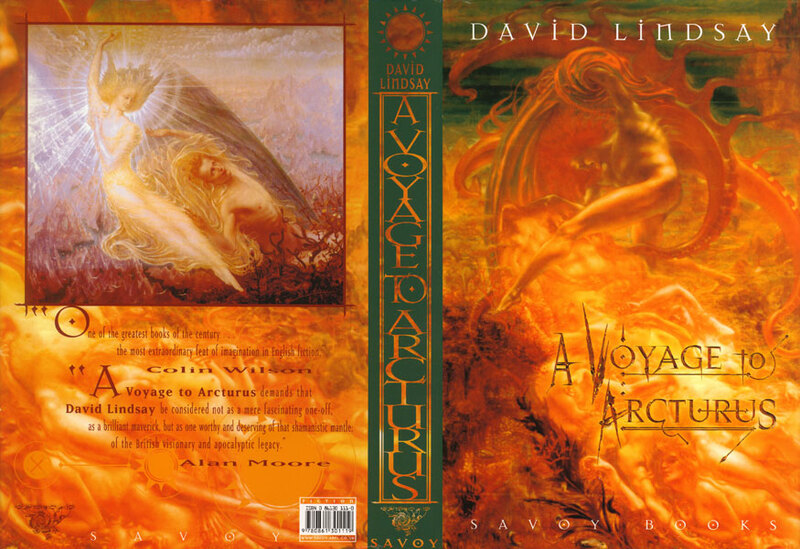 Wilson's first essay on David Lindsay is his most openly celebratory, having being written a few years after encountering A Voyage to Arcturus for the first time. The chapter "Lindsay — A Voyage to Arcturus" is over 30 pages long. 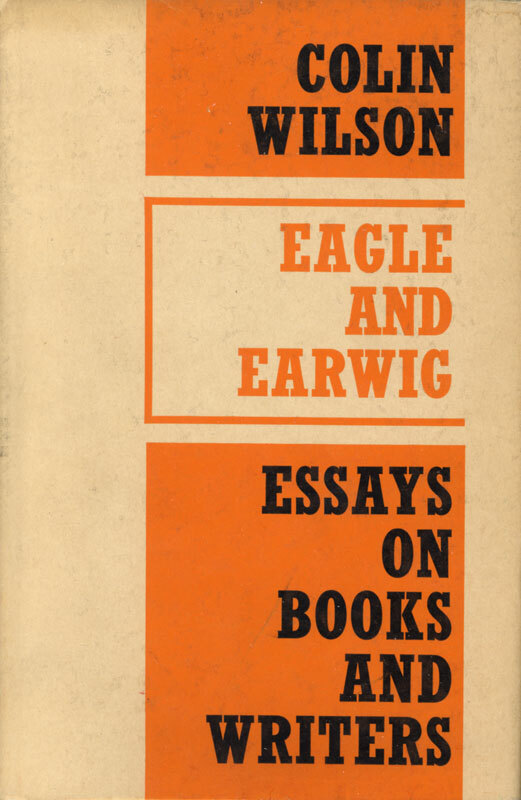 Eagle and Earwig is a collection of literary essays whose subjects include Lindsay's writer-friend L H Myers, Wilson favourite George Bernard Shaw, Ayn Rand and Henry Williamson, among others. One essay, on both John Cowper Powys and Ernest Hemmingway, gives some idea of Wilson's eclectic approach. This is Wilson's most extensive examination of David Lindsay's life and works. It has been reprinted (with slight modifications, see below) twice, once as a standalone book, The Haunted Man, and once as an appendix to the Savoy edition of A Voyage to Arcturus. Wilson was the one who got The Strange Genius off the ground, suggesting it as a project to give E H Visiak (then rather bored and in a retirement home) something to do. When the two heard J B Pick was also considering writing on Lindsay, Wilson contacted him and Pick joined Wilson and Visiak for what I think is still the most valuable book on Lindsay. Approaching the novel as a means of performing "thought experiments", directed at answering the question "How should I live my life? 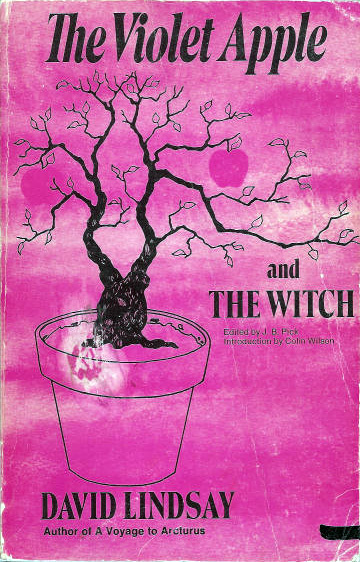 ", Wilson traces the development of the experimental and popular forms of the novel from its origins in the Pamela craze of 1740 to the boom in fantasy that was underway at the time Wilson was writing. The final chapter is an examination of Tollkien's Lord of the Rings and David Lindsay's novels. Wilson says: "One thing emerges from the study of Lindsay's work; fantasy is not another name for free-floating imagination. It is a highly disciplined faculty that uses imagination to explore ideas..."
When he learned there was an unpublished David Lindsay novel still extant in manuscript, Wilson tried to get Gollancz to publish it. It turned out that Victor Gollancz had already seen, and rejected, it. When Alexander Besher learned about it, and managed to get it published through the Chicago Review Press, Wilson wrote this lengthy (18 page) introduction to the book, with a brief but insightful look at Lindsay's life and works. This is a reprint of Wilson's essay from The Strange Genius of David Lindsay. There are a few changes to the text. The most noteable is that, whereas in "Lindsay as Novelist and Mystic", Wilson refers the reader to E H Visiak's summary of the plot of The Haunted Woman elsewhere in the same book, here he provides a page-and-a-half summary of his own (from halfway down p. 36 to the foot of p. 37). Otherwise, apart from noting that E H Visiak is "still alive", and incorporating the footnotes from "Lindsay as Novelist and Mystic" into the text itself, the essay is identical. 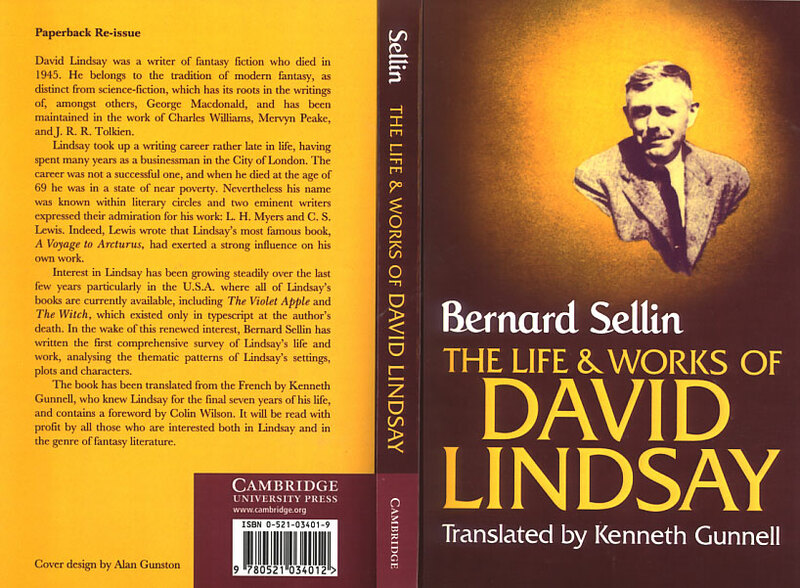 A short (6 page) foreword to Kenneth Gunnell's translation of Bernard Sellin's biography/literary study, for the bulk of which, Wilson talks about the stiffness and formality of Lindsay's prose style. "David Lindsay is at once one of the most remarkable and one of the most tragic figures in 20th-century literature", is how Wilson begins this brief (5-page) summary of Lindsay's life and ideas. 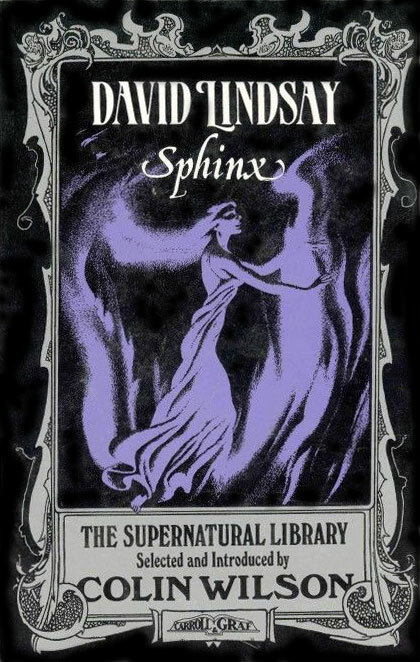 Wilson ends by calling Sphinx "one of his most haunting and memorable novels." 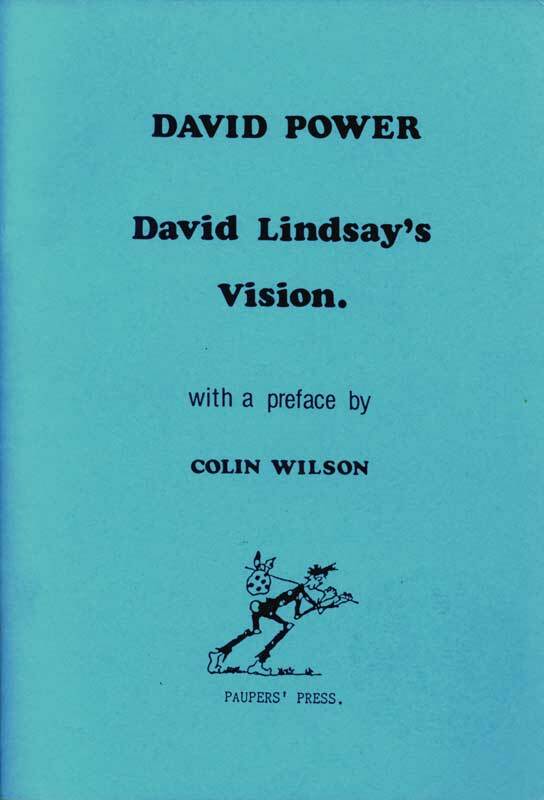 Wilson provides a brief (3 page) biography of Lindsay for David Power's study of Lindsay's novels. There are minor differences between the text of the Paupers Press booklet and the eBook, reflecting both the change in format ("eBook" replaces "booklet" in the text) and the added material Power wrote for the electronic edition. Inspired by Henry Miller's book of the same name, Wilson takes a look at some of the books that have influenced him in various ways. The Lindsay chapter covers how Wilson first encountered Lindsay, looks at A Voyage to Arcturus and The Haunted Woman briefly, then recounts his friendship with E H Visiak which arose as a result of Wilson's interest in Lindsay's work, and concludes with a look at Visiak's novel Medusa. 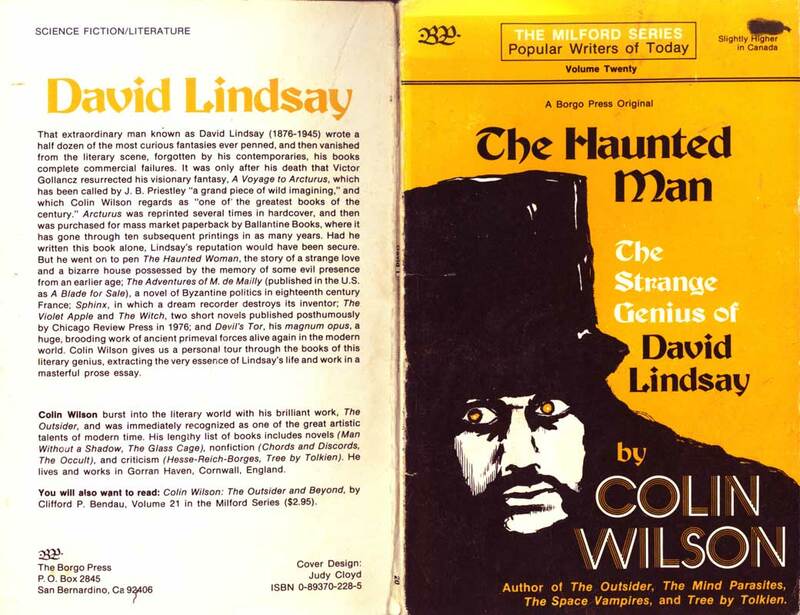 A third reprint for Wilson's "Lindsay as Novelist and Mystic" essay, this takes its text from The Haunted Man (i.e., it includes the plot summary of The Haunted Woman). The only change from the previously published versions is, understandably, that the reference to E H Visiak still being alive is dropped. After this is a tipped-in 3-page afterword by Wilson, which begins "David Lindsay's life is one of the saddest stories in 20th century literature", and concludes by reiterating that "not only is this one of the greatest fantasies of the 20th century, but possibly the greatest."